KZ-115 MXV low output PAF humbucker clones from the dawn of the PAF era! KZ-115 P.A.F. Clones Featured in the Doug and Pat Show! Standard magnets for this set are Long A2. A4 and A5 available upon request. ​Custom made to your specs. Pickups ship within 5 days of payment. Neck and bridge 7.70K-7.57k with your choice of long A2, A4 or A5 magnets. (Standard with long A2). ​With our exclusive timed wind, center focused coils. ThroBak KZ-115 PAF humbucker reproductions represent the tonal dawn of the PAF pickups era with an accuracy that can only be matched if you took a time machine back to the Gibson Kalamazoo factory in 1957. Wound on the very KZ/LP-115 winding machine Gibson used for both PAF humbuckers and P90 pickups in 1957 and rescued from Kalamazoo by none other than Les Paul himself before Gibson's move to Nashville. ThroBak KZ-115 PAF pickups awaken the elusive early PAF pickup dynamics and low end depth of the originals. The KZ-115 owes its distinct tone to the custom Gibson Kalamazoo winding fixtures, wire guides and set-up of the original vintage winder. The original, non adjustable, 1950's lobeless cam traverse and limiting fixtures, wind what we call the KZ-115 vintage center focused coil. These center focused coils create a fuller bobbin for the same number of turns than coils wound on the other known PAF winders, the Leesona 102, Slug 101 and ME-301. The result is a PAF pickup reproduction with added scatter for a woolly low end and crispy/crunchy mids. ThroBak KZ-115 proves again that the machines matter when it comes to vintage PAF accuracy! Available with long A2, long A4 or long A5 magnets, these timed, vintage wind, vintage PAF pickups reproduction offer the same variation of the early vintage PAF's but with the magnet choice in the players control with the wind time under ThroBak's watchful eye. 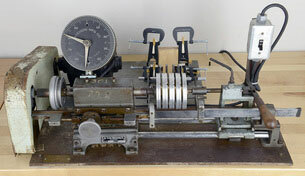 Vintage Gibson KZ/LP-115 winding machine makes all ThroBak KZ-115 PAF clones. Click photo to learn more. 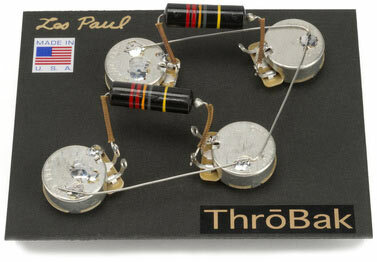 Video of the Historic Gibson PAF humbucker winder used for all ThroBak KZ-115 PAF pickup clones. Maximum Vintage PAF Clone Specs. • Vintage PAF clone Butyrate bobbins tooled and molded in the USA to vintage specs..
• Coils wound on vintage KZ/LP-115, Gibson customized winder for unsurpassed vintage winding accuracy. • PAF repro baseplates tooled and stamped in the USA for ThroBak. • PAF clone covers stamped in USA and Nickel plated (with no Copper) at the same Kalamazoo shop that plated vintage PAF covers. • Pole screws with vintage alloys cloned from 50's vintage PAF screws with cold form die tooled for ThroBak. Made in USA. • Slugs with vintage alloys cut with a vintage Brown and Sharpe automatic screw machine for correct vintage look. Made in USA. • Vintage Spec. Plain Enamel 42AWG magnet wire made with vintage coating and processes. Made in USA. • Alnico magnets custom cast in the USA with vintage formulations. • Vintage correct braided wire. Made in USA. Upgrade to a ThroBak 50's spec. wiring harness when you change pickups. Click to learn more. 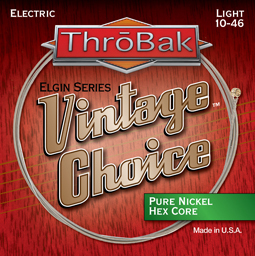 Click to learn about Vintage Choice™ strings.